After seven years of a committed relationship Danielle King and Byron Waupoose decided to confess there love to each other at a ceremony held in their home town of Milwaukee, Wisconsin. The couple was married at their favorite fun restaurant/recreation place. 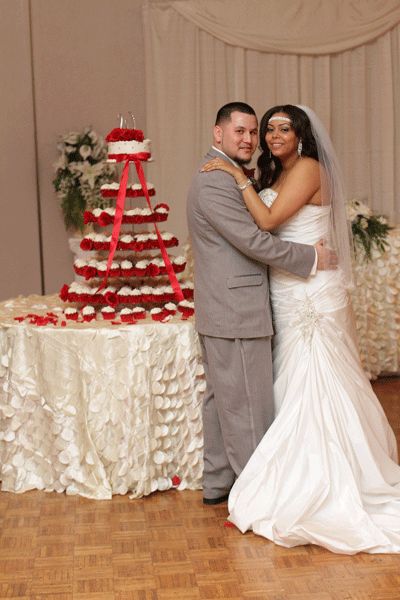 With 250 family members and friends to include on their day, they chose the Serb Hall for its capacity and style that mirrored their own wedding taste of a classic Red, White and Gray theme. The couple’s ceremony included ten bride maids, and groomsmen, three flower girls, two ring bearers and three ushers and hostesses. The bridesmaids wearing long gray gowns and carrying red and white rose flowers wristlet as their bouquet, complimented the groomsmen that wore three piece gray tux with red vests and ties. The bride wore a beautiful strapless wedding gown and the groom wore a gray tux with a white vest and tie. The bride’s bouquet was specially made for her with red roses and using several or her grandmother’s diamond and pearl broaches. The Red, White and Gray color theme continued throughout the reception with the linens, centerpieces, candy bar and flowers. The cake or should I say the cupcake wedding cake was displayed on a round table with a vibrant rose petals tablecloth. This cake table was diffident the focal point. Music was played by the DJ that keep the bride, groom and all the guests dancing all evening while special lighting was flicking in the background. Denise Bonds thanks all of the vendors for a wonderful job they did in making this couple have their special day.